Will Chrome OS deliver us the disposable PC? During a visit to Google's London HQ we grabbed some time with Chris DiBona. He's the Open Source Programs Manager for Google, overseeing everything the corporation does that's open sourced and making sure it's "correct and useful." We talked Google Chrome OS and, later, Android. We put to DiBona the issue that if users buy a netbook, they still tend to expect Windows on it, so will they take to Chrome OS? "Yeah. Windows or Mac. Is this going to change? We're going to find out. We're willing to say, you know what, let's give it a try, let's see if it works. "We think it can, obviously, otherwise we wouldn't be doing it. For some people it will be for an auxiliary machine, for others it might be a primary machine. But we'll see. And the only way to know is to try it. "People haven't really tried small, thin, practically disposable computers. There's still this regret if a computer breaks. We want to make one where that's not the case… so if you leave it on a plane… you're not worried about your data. It's a different approach. And if someone's going to do it, it might as well be us." DiBona has a wide-ranging role, and is also responsible for Google Moderator, the polling locations API. "My whole job is about making it easy for engineers to release software," he explains. 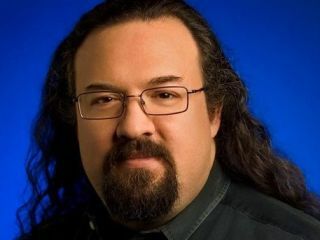 DiBona seems relaxed and is happy to talk candidly about Google's work on Android and Chrome OS. "[My team] helps with the licence strategy from the very beginning. When you use as much open source as we do, you can screw up and we don't want to do that." "We have been [encouraging open source] as much as possible. Then you have bigger projects where open source is a key part of the strategy, such as Android and Chrome OS where we feel making it open source helps drive the platform at a speed we haven't seen before." "You can especially see this with Android – devices are coming out all the time that we know nothing about, and that's pretty great. Sometimes we know about them and just don't have the time to help." So how does DiBona feel that Google can keep Android partners close? "We feel that if we continue to execute and make a very good mobile operating system then as those people create new devices [developers will]… stay close to what we're doing because we'll continue to move the platform forward. It will pull all the fragments and little forks with it." Some devices provoke amusement: "At CES we had a microwave running Android and it's like 'really?' Obviously we're not going to optimise the environment for popcorn! Ostensibly you could run an app on a microwave I guess. "[Android is] a young operating system but I think we're doing OK. "
We asked DiBona what he felt about a potential conflict between Chrome OS and Android now that Android has started to appear on some netbook-type devices. Does he think it's confusing? "It is yes. See Android is really not targeted at netbooks. I don't think you'll see a lot of Android netbooks… that are commercially targeted. Chrome OS is very different… it's optimised for that kind of experience. "It's a different approach towards getting online. A very stripped down approach. A very web approach. It gets out of your way and says 'here's the web'." We also asked DiBona how Google seems to be able to release products such as Android so quickly in comparison to other companies: "Well there's no reason for it to be slow. A lot of companies get wrapped up in how software is valuable and for Google software is valuable because of what it allows our users to do [as well as external developers]."